A specially selected brand new ballooning lodge 50km north of Johannesburg, 10 minutes drive from the Skeerpoort Ballooning Field. The Harrop�s two adjoining newly built three bed-roomed guest houses at Olive Tree Cove are but a short walk through The Coves upmarket holiday villages to the shores of Hartbeespoort Dam in the Magalies River Valley. Each lodge offers secure, welcome, modern hospitality that combines comfort with luxury and is fully air-conditioned with its own lounge, dining room and patio just 30 meters from the swimming pool on one side and 100 meters from a small private air strip on the other. The surrounding area offers a wide range of leisure activities including, boating, horse-riding, mountain biking, golf and, of course, hot air ballooning with Bill Harrop�s �Original� Balloon Safaris. Also exclusively available to Olive Tree Cove guests is access to the Harrop�s 87 acre Skeerpoort ballooning field and country base where one can enjoy picnics, tranquil nature walks, bird-watching, fishing and row-boating on their 2 km. of private river. Bill Harrop´s "Original" Balloon Safaris has been operating as a legally licensed balloon Air Transport Service since 1981. It is a family business run by Bill Harrop, his wife Mary, son Sam and daughter Sarah working in partnership with over 40 full time, part time, contract and casual staff. Only qualified and experienced professional pilots are employed, and over five-thousand very happy passengers a year are testimony to our professional attitude in entertaining you to one of the most memorably enjoyable experiences of your life. 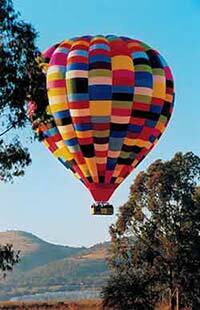 We run a fleet of six large hot air balloons which can carry between six and eighteen passengers each. So whether it is a romantic balloon flight for 2, or a party for 18 adventurers in one of the biggest balloons in the world, or a corporate adventure for 142, Bill Harrop´s "Original" Balloon Safaris is the preferred choice for safe, reliable, quality ballooning. Bill will also admit to experience as an ocean yachtsman, singer, hotelier, portrait photographer, advertising executive, and a balloon pilot examiner. He has served on committees of the Southern African Tourism and Safari Association, The Magalies Meander, the Balloon and Airship Federation of South Africa, and two years as the National President of SKÅL International (a worldwide body of travel and tourism management professionals). He firmly believes that attention to service excellence and a commitment to care for ones community will build a better nation, especially through education, and is a recognised benefactor of the Tourism Education Trust.